Family friendly beach bungalow with private *heated pool/spa. 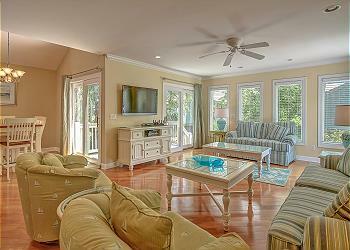 3rd row from the ocean, Hilton Head beach is just a short walk from the front door of this 4 bedroom home. Main level living makes this rental home easy to accommodate all ages and the beach décor is relaxed and pleasant. Spacious living area has room to relax and overlooks the secluded pool deck. 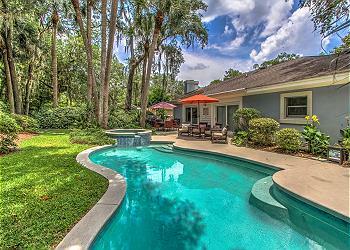 Enjoy grilling out or cool off in the pool after a day at the beach. The master bedroom is outfitted with a king bed with new bedding, a private en-suite bath, and new flat panel TV. The second master also features a king bed with new bedding, a private bathroom, as well as a large flat panel TV. The third bedroom has a new set of bunk beds with twin bed on top, double bed on the bottom and a pull-out twin trundle. This room is perfect for the kids. The 4th bedroom has 2 twins and a flat panel TV. The 3rd and 4th bedrooms share a full hall bathroom. Don’t forget to take advantage of the free tennis nearby! The short walk to the beach and private pool make enjoying the Island weather a breeze. •	Private Pool (14 x 27) *This pool & spa have an electric heat pump. The pool & spa can be heated for an additional fee of $300 + tax per week. We had a great stay at this house. The location is perfect. It’s on a quiet street and is only a short walk away from the beach. Many restaurants, shops and a grocery store are close. The house is laid out very well, and the kids loved the bunk beds. The pool and spa are beautiful, the kitchen was well equipped, and the beds were comfy. Overall, it’s a great place, and we were very happy. This vacation home is wonderful! We have stayed here multiple times and it never disappoints! Having a home for a multiple families, the layout was perfect! The private pool and easy walk to the beach was way more than we could ask for! Thank you for such a beautiful and cozy home!